"Alan played a huge role in my development on and off the court and his guidance helped me get to where I am today. This book is a must read." "Alan shares what it takes to take your game to the next level. 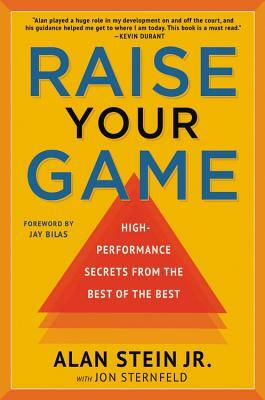 Raise Your Game provides tools, concepts and strategies you can utilize today to enhance your influence and make an immediate impact on your team, culture and organization." "Simply put, Alan Stein is the best in the business. I worked alongside Alan for years and his ability to motivate and inspire is second to none.. His passion inspires everyone he connects with to push their limits. Alan gets results. Period." "Alan's first hand experience with elite basketball players provides an unmatched angle on exactly what is needed to help any business or organization thrive. Our entire team was really empowered by his talk." "Alan's talk was an unbelievably motivating way to kick start our company off-site. He was funny, interactive, and engaging, all while driving home extremely important take-a-ways for our team to get better." "If you need a speaker that can captivate and engage an audience, you will be blown away by Alan Stein. He walks the walk and gets the audience to relate to his stories in a way that they too, feel empowered to lead. He delivers a powerful message in a practical, insightful and entertaining way." "Alan's innate ability to speak passionately and with substance make him one of the best corporate speakers I've had the pleasure of experiencing. He recently received a standing ovation after his keynote performance in Cancun, Mexico at our annual company convention (where he address hundreds of fitness executives, managers and directors). His talk was one of the highlights of our event. We will undoubtedly have him back to speak again." "Alan has a unique ability to enthrall any audience with his passion, energy and authenticity. His experience with world-class athletes provides an unparalleled perspective on teamwork and leadership. Alan is extremely impactful when sharing the tools needed to level-up any organization in today's hyper-competitive and dynamic marketplace."